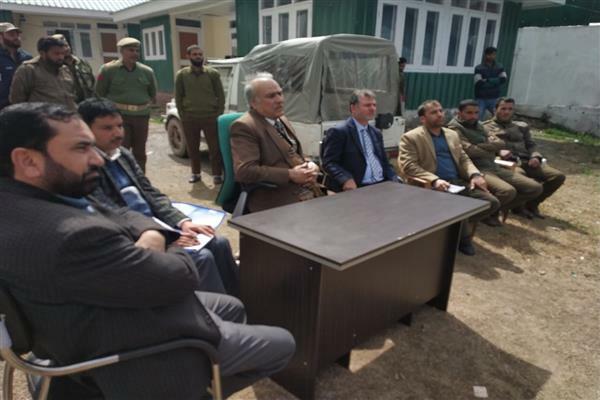 Srinagar, Mar 18 (KNS): Juvenile Justice Panel headed by Justice Husnain Massodi comprising of G.A Sofi State, Mission Director ICPS and local authorities visited Kamalkote area of Uri in Baramulla district spread over 15 villages with 25000 populations to have an on spot assessment of the problems faced by children because of shelling. The panel interacted with Sarpanchs, panches and other respectable of the area. The panel was told that the area does not have internet connectivity and adequate healthcare facilities that compound the problems of the local population and in particular children in Shelling and like emergencies. It was also brought to the notice of the panel that no steps have been taken for construction of community bunkers in schools and individual bunkers as is being done in other LOC areas. That all the 25 schools in the area lack facilities for extracurricular activities both indoor and outdoor. The locals demanded LOC reservation for the students of the area enabling them to compete with the students from peaceful and shelling free areas. Free ration for at least for BPL families was demanded as the Shelling deprives such families of whatever meager income they have, without capacity to purchase the ration even at concessional rates. The worst victim, it was stated, are children of such families pushed to near starvation and to child labour.